I like to think I’m someone who keeps up with trends or follows seasonal changes. This winter though, I’ve found myself loving brighter colours. Nail Polish is definitely where I’m more experimental but wearing a bright lipstick more than once a week is unheard of! This change might be because I’ve been wearing more traditional Indian clothes and somehow I feel like bright lipsticks just go better with it than my usual basics. I have devoted the last drawer of my Muji setup just for favourite lipsticks. Most of the year it’s filled with different nudes but in the last two months a lot of brighter colours have found their way in there. That’s how I know it’s the real deal. I want to quickly share with you what’s on top of my list! Nails are easier to transition to when it comes wearing brighter colours. I might go for nudes more often on my fingers but it’s always something fresh and vibrant on my toes. While I enjoy a lot of pinks and lavenders, a punchy orange red like Chanel Espadrilles seems perfect for any occasion. Essie Clambake is a close dupe but Espadrilles has that orange red balance just right. I can’t really tell the difference between the old and new Chanel formulas though; this one needs two coats and lasts well for a week on me. 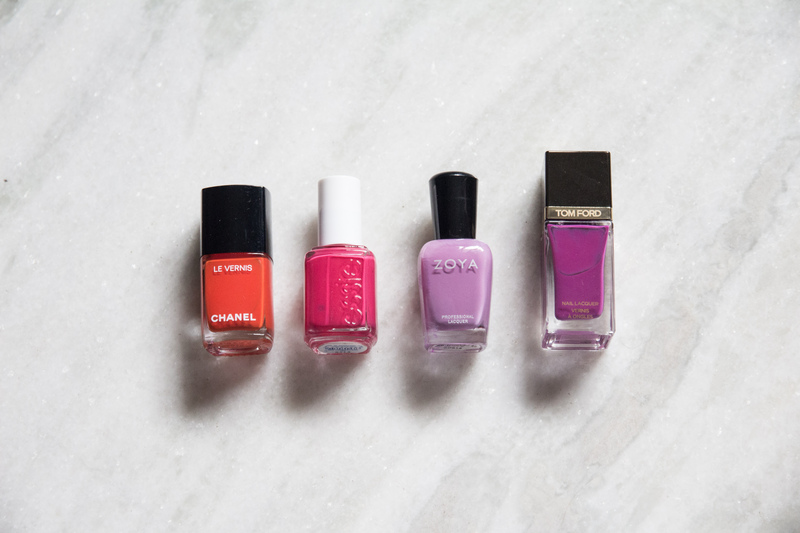 In terms of striking a balance between colours, Essie Watermelon does that just as well between red and fuchsia. 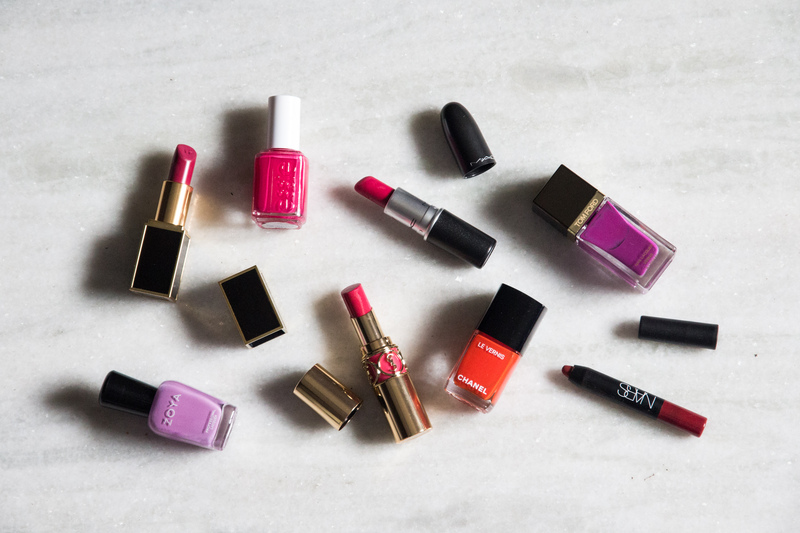 It’s another shade that always makes you want to go on a vacation. The formula here is a one coater! Zoya Perrie is one of my oldest nail polishes and a great testament to the formula that has remained unchanged in the last 5 years or so. It’s that good! I adore this shade because it’s a pastel that isn’t too light and looks vibrant (as much as a pastel can). Tom Ford African Violet might deserve a post of its own because the packaging is so pretty but this colour won me over on first sight. It’s a brighter violet magenta that would look great on anyone. Essie DJ Play That Song is a close dupe although the formulas are very different. To be honest, I didn’t find anything spectacular with the Tom Ford formula that OPI or Zoya can’t do. It keeps the shine for a few days and overall lasts a week on me. I definitely wouldn’t call this a must have but it’s something I splurged on. Speaking of a Tom Ford item that is worth the price, let me introduce you to Tom Ford Matte Lip Color in Plum Lush. I think the matte formula here outperforms any other one from TF but this shade in particular is just too gorgeous for words. In my book it’s the perfect berry tone; more pink, bright, but not too dark. The soft matte formula is very comfortable and weightless. I would recommend this shade to absolutely anyone. Also, all the lipsticks mentioned here make my teeth look more white. A “mindless” purchase at Narita Airport that I initially regretted has recently made me much happier. 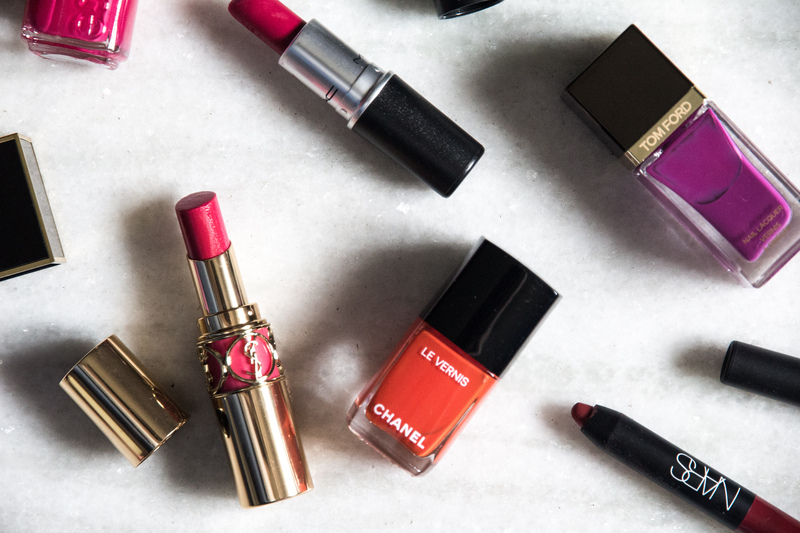 From a sea of reds and pinks, I was instantly drawn to YSL Rouge Volupte Shine Rose Asarine at the counter. While not very long lasting, I do like the Rouge Volupte Shine formula for the comfort and shine. This particular one is very pigmented and almost opaque. 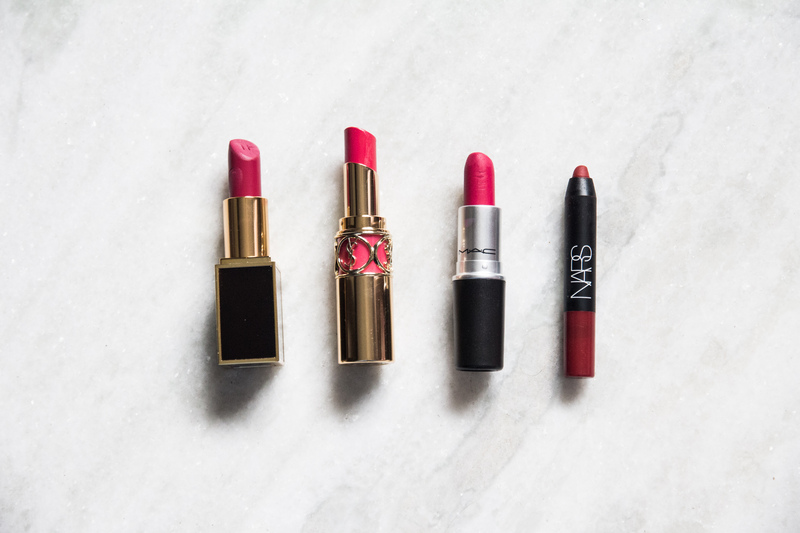 I just adore the red pink shade, it’s so flattering. Mac All Fired Up with it’s Retro Matte formula is similar on paper but the finish does make the appearance very different. All Fired Up leans more red while Rose Asarine leans more pink. Possibly one of the best freebies I’ve ever gotten is the Nars Lip Pencil duo from Sephora. It makes the experience of using Nars Velvet Matte Lip Pencil in Cruella more special! I always feel like a true red or something akin to a tomato red looks just trashy on me. Cruella is cool toned, darker and yet, not straight up vampy. It really is one of my favourite reds. I hate the fact that this has to be sharpened but it’s got to be one of the easiest mattes to apply in it’s crayon form. I have spoken about three matte formulas here because I tend to prefer for brighter colours. I’ve found that Tom Ford is the most comfortable to wear while Nars is more long lasting. Mac’s Retro Matte formula is drier and hence gives a more true matte appearance and also lasts longer than Tom Ford. It’s hard to pick a definite favourite though. So proud to present a post devoid of “neutral” or “muted”. That’s a first for me. I know this isn’t a more comprehensive post with swatches and all but I was itching to post these! Definitely let me know your most used bright lipsticks. I have a feeling I’m missing out on a lot of them.